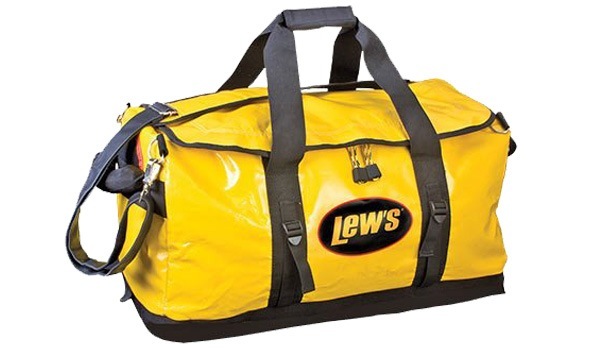 Enter for a chance to win a Lew’s Speed Boat Bag to keep your fishing gear safe and organized! NO PURCHASE NECESSARY TO ENTER OR WIN. Making a purchase will not improve your chances of winning. Sponsored by W2F (Wired2Fish, Inc.), 29 County Road 63, Grand Rapids, MN 55744. Sponsor’s decisions concerning all matters related to this giveaway are final. This giveaway begins on January 30th, 2017. To enter click on the link provided. Limit of one entry per person, per day. No responsibility is assumed for late or misdirected entries or prize acceptance responses. Entries must be received by February 14th, 2017. Odds of winning depend upon the number of entries received. Five winners will be chosen to receive the prize. No cash substitution, transfer, or assignment of prizes allowed, except by W2F, which reserves the right to substitute prizes of equal or greater value. Winners must pay all costs and taxes other than those specifically identified in the prize description. Limit of one (1) prize per person. Five potential winners will be randomly selected on or about February 15th, 2017, and notified by e-mail. If attempted notification is returned as undeliverable, if a potential winner cannot be verified, or if a potential winner is otherwise unable or unwilling to accept the prize, then prize will be forfeited and may be awarded to an alternate winner provided sufficient time remains, in W2F’s discretion. Open to all W2F readers. Void where prohibited by law. Winner must be at least fifteen (15) years old. W2F employees and their immediate family members are not eligible to win. Winner grants to W2F the right to use their name, photograph, likeness and biographical information in advertising and promotion without compensation or permission except where prohibited by law. Winner releases W2F from any liability arising out of participation in this giveaway or the acceptance, use or misuse of a prize. Winner’s names will be posted on Wired2Fish.com.